Since a while in my daily work of hanging around with iOS apps, I had to find a way to easyly retreive iTunes Store meta data. It have started once with a marketing requests like “can you please provide with our apps icons”, then it quickly became “why is the provided icon square and is missing the glossy part?”. So I get my hands on iTunes Store meta info management and find my ways to retreive them easily. Here’s my 2 cents about how to play around with App Store meta information. If you just need to have a nice version of an icon with its rounded corner and Apple applied glossy effect, this is an easy one as it can be retreived from iTunes. If you want to have access to all meta data of an app, it’s a litle bit more ‘technical’, but Apple do provide with an API to gather all apps meta information in a JSON file format (the so called Apple Search API). If now you want to have access to all apps data and dynamicaly manage them to run a web site or a recommendation system based on theses apps meta info, you have what I would personnaly call the ’Big Berta’. Apple goes as far as providing to you with the full iTunes Store database that you can download for your own usage! The easiest for this is to rely on iTunes application itself. Indeed, iTunes have it right there in 512x512 size. As long as you have downloaded an app from the AppStore, depending of your config, you most likly have it synced with your computer. To get the 512x512 from iTunes, click on Apps within your Library and find it on the right pane (or use the search function) and click on the icon. You should see at the bottom left of the window the 512x512 icon version. Make sure the area that show image of selection is up. This is a show/hide popup window that can be trigered with the litle triangle within a square as shown with the red circle in the picture. The really good part here is that this 512x512 icon comes with it’s rounded corner on a transparency background! Off course Apple glossy is apply only if the app on iTunes Store have been submitted with the UIPrerenderedIcon set to NO. Apple do provide with a mean to search for any products in iTunes thanks to a web based API. The so called ”Search API” will return uppon request an JSON file with all apps meta information. This API let you either search for a particular term (like all apps with "yelp" term in the US), or either lookup for a particular item info (like all info about THE Yelp app). You will find more details in query types and variable formats on Apple Search API documentation page. where: ‘id’ is the AdamID (App ID), country is the ISO country code and lang is the 5 digit code like en_us (for english = default value), or ja_jp (for Japanese). Unfortunately, for some unknown reasons, lang parameter currently have an issue. In theory and according to Apple documentation, it should be possible to request localized content (Marketing text in particular) while setting the lang= param. But if you test the upper link that request info for yelp app, whatever param you set for lang, you’ll never get anything but english text. I beleive this is a bug/regression as this was working before. Thanks Apple is consistent in the way of designing APIs, so, it you really want to find app localized text using search API, you can insert “/<2-digit-language>/” before the lookup? term. 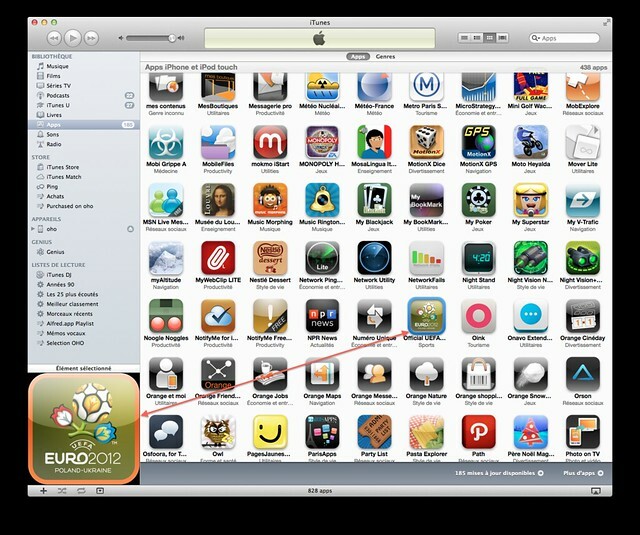 Apple made available upon request the all iTunes Store and App Store database for you to download and sync. It’s a one time weekly full export then for the next 6 days, it’s an incremental version. It can be huge to download and as you can imagine, it’s also a huge database to manage. Apple is currentlty providing with a python script for importing to your relational database the downloaded content. Within EPF database, you’ll find almost all meta information available for an app (like Marketing text, icon urls, screenshots urls, categories, name, editor, web site, Localisation text, first release date, version number, and some few other ones), but this is currently not as complete info as it is with Search API. Indeed Search API do provide with some info EPF do not provide with. Such info are (from memory): rating, average rating, number of ratings, ratings for current version and for all versions, Bundle ID, release note, content advisory rating, supported devices, Game Center enabled and wether it’s an universal app or not. For some reasons, it’s hard to find on internet resources and information about EPF. But everything (or almost) is documented on Apple EPF dedicated web site and associated documentation. If I can find some free time, I might do one day a dedicated post on this.